Coffee. The elixir of…. all things good. Thankfully I’m one of the lucky ones that coffee (or caffeine) does not keep me awake. So I have been known to partake of it all throughout the day. During the cold weather months, this is especially the case. I so enjoy my first cup of coffee every morning the most, though. I get up early before anyone else in my home during the week, and that hot cup of Caza Trail’s single serve Donut Shop blend gets my morning off on the right foot. I’m usually seen with my travel mug filled with Donut Shop blend coffee and a little creamer when I’m out and about. You can locate the Donut Shop blend and 24 other Caza Trail varieties on their Amazon page. I love that they come in single size servings as I’m always on the go, especially this time of year! I love finding new coffee for my Keurig! Thanks for posting. The more flavors I learn about the more I want my own Keurig! Thanks for this post Donna! I love the smell of coffee in the morning even if I don’t drink it. I’m a hot chocolate kinda gal. I have heard the praises of this coffee but have never tried it. I am a Folgers gal and I guess too cheap to get individual pods! Oh that sounds like a nice coffee!!! My Keurig died so I need to get a new one so I can try this!! I think my boyfriend drinks donut shop coffees if I remember right. I use my Keurig for hot cocoa and hot chai tea. My husband really enjoyed this coffee! I’ve finding that since winning a Keurig, I’m much more likely to try a new coffee blend than I was prior to owning one. I guess it’s just so easy and quick to pop in a kcup over making a whole pot of coffee. Plus, if I don’t like it, I can give it to my bestie! My hubby would definitely love this. Sounds delicious. Love the smell of it. Great for early mornings. I haven’t tried their Donut Shop Blend yet – but I do love their Dark Roast! haven’t tried this, but i usually LOVE donut shop blend! All this talk about coffee is making me want a cup lol. I used to think that caffiene wasn’t keeping me awake, until I cut back and I realized how much better rest I got. I’ve never had the donut shop blend but I bet my husband would like it. I’ve had other donut shop varieties, but the one in my cabinet tastes like chemicals. Hopefully, Caza Trail treats me better! We tried this and really enjoyed it! love coffee, wonder how this tastes as iced coffee? I really need to start drinking coffee. This sounds delish. I got a Keurig for my birthday last month and have been enjoying making different coffees. I will purchase this Donut house and try it. I miss caffeine. I wonder if they have the Donut Shop variety in decaf! I’ve been very happy with this brand. Oooh so yummy! We love coffee but use decaffeinated. 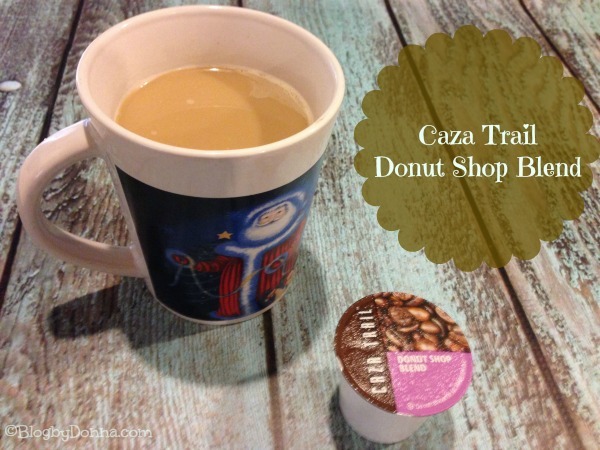 I LOVE Caza Trail – the donut shop is great! My husband would like this – I’ll have to share with him. Thanks! I love a good cup of coffee, but I haven’t tried this one yet. I love using my Keurig. I’ve never tried this brand of K-cup but I totally need to pick some up next time I purchase some.